When it comes to showing your gratitude, there’s hardly a better option than sending a handwritten note. 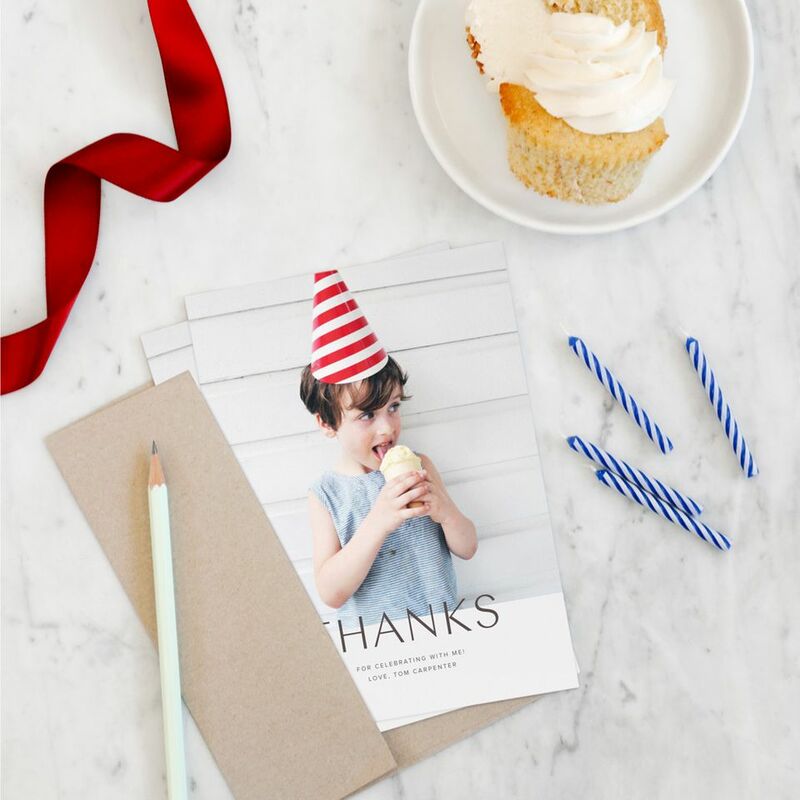 Why not add an additional layer of thoughtfulness by creating your thank you card from scratch? Full of charm, homemade cards also lend a touch of personality and individuality with each rendition. These DIYs are straightforward enough that beginning crafters and kids alike can start practicing the art of gratitude—from start to finish. Snip a few triangles from an assortment of patterned papers (or fabrics), then attach to a rustic twine to string across the face of the card. Use a marker to add a letter per triangle, or let the banner speak for itself and save your message for the inside. Participate in the unicorn trend with this three dimensional card. Using a simple circle cut-and-paste technique, the body becomes a sculptural pop-out when the card is opened. This craft is especially great for little ones practicing their cutting skills. Before you peel, boil, and mash all your potatoes this Thanksgiving, set one aside to use as a quick and easy paint stamp. Crafters can transform that blob of paint into a funny little turkey with just a couple of fingerprints and construction paper beaks. Practice patterning by filling each sticker dot with a different design! Keep things monochromatic or go for a colorful rainbow effect. These pre-sticky circles keep this craft mess-free and quick. With a white crayon, watercolors, and a little magic, your little ones can easily create their own wax resist artwork. Especially friendly for even the smallest painters, simply write a message using wax, then paint over top to reveal. Perfect for showing a bit of extra thanks to your kid’s teacher or daycare provider. Especially fun and tactile, this card design demands a bit of messy fun! Dip and print fingertips, then draw them into teeny monsters. Don’t forget to leave a couple blank for your recipients to join in on the crafty fun! Tape out a bold message or simple design, then paint directly on top. Peel the tape to reveal your negative space design. This one’s great for kids learning to send thank you notes for birthday presents and graduation gifts. Looking for a perfect summertime thank you card option? Use colorful washi tape to decorate popsicle-shaped cardstock, then paste them onto wooden craft sticks for a three dimensional effect. A perfect option to thank a group instructor, this thumbprint card couldn’t be easier. Experiment with finger paint or ink, and have students sign their names inside for a little extra personalization. Break out the craft sticks and washable paint for this fun DIY card. Kids can arrange the wooden sticks into flowers (or snowflakes or stars), and then glue to some sturdy cardstock. Bring a little light to your recipient with this sunny card! Washi tape makes this design especially accessible for young crafters—no freehand straight lines needed for the sun’s rays. Not only are these homemade thank-yous simple and straightforward, they also provide another great way to recycle those wrapping paper scraps. Bonus points for matching the wrapping paper to the gift-giver! Perfect for the littlest gift recipients, these clever fill-in-the-blank notecards allow your child to practice demonstrating gratitude while writing just a few words at a time. These clever designs from It’s Always Autumn are free and easily downloaded and printed—no crafting required. Is there a better time of year than Thanksgiving to demonstrate appreciation for your loved ones? A riff on the traditional handprint turkey craft, these cute designs can be used for place cards or to write a sweet note thanking your dinner guests for attending. If your refrigerator is getting cluttered with your little artist’s finger paintings, try repurposing the artwork into original thank you notes. Frame squared-up bits of paintings using cardstock, then write a message on the inside. Don’t forget to attribute the artwork to your little one! Teach kids to recreate the 3D artwork of some of their favorite storybooks with this simple pop up technique. Make the craft simpler by handling the cutting yourself, then letting kids attach stickers or drawings to do the popping. Upcycle a few old paint chips into monochromatic, minimalist thank you notes. These look especially refined mounted on cardstock and scrawled with a fine tip paint pen. Everyone loves a good food pun, and there’s no shortage of those when it comes to thank yous. Illustrate a bunch of purple grapes for this quippy card (or bananas, flowers, or anything else that’s bundled in bunches), and add a personal message inside. Mix patterns and colors, in the style of these happy appreciation notes, using washi tape and watercolor paint. The more chaotic the action on these, the better the result! This cute little card puts patterned paper scraps to great use! Cut out a few teeny envelopes (this step is made way easier with the help of a rubber stamp), then thread onto jute or hemp. Secure the banner to the front of your card (or to the inside for a fun surprise) with a couple of metal brads. Your little one’s hands become the template for this clever card’s front and back. Tweak the greeting to read “Thank You,” and you have a personalized, kid-centric option for a creative note of thanks. These colorful notecards use a technique simple enough for the smallest artists. Squirt a few dots of paint on one side of the card, then pull a small piece of plastic over to create stripes (a spent gift card works great). Felt is a beginning crafter’s most forgiving medium: it doesn’t require a stitched edge, sticks easily to itself, and comes in a rainbow of fun colors. Layer shapes and letters for a lovely set of textured thank you cards. If you have a sewing or embroidery novice at home, this is a great project to develop those needlework skills. Recycled cardboard makes a great base for yarn stitching, so put those old shipping boxes to use! Naturally, you’ll take hundreds of photos at your little one’s celebration, so why not share one special snapshot with your guests? Print onto cardstock and add your own caption before filling the interior with a note of thanks.